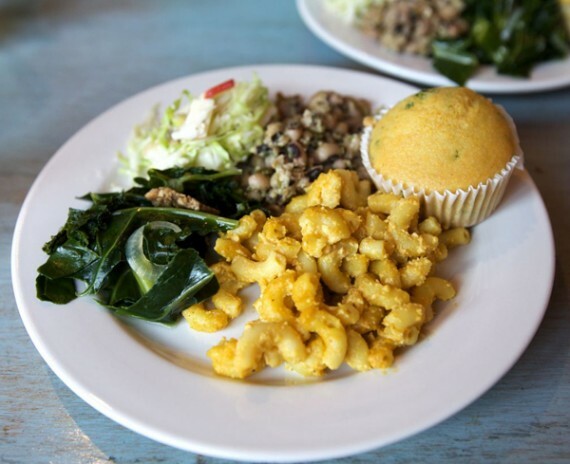 quarrygirl.com » Blog Archive » all you can eat vegan buffets: soul food, brunch, indian food! all you can eat vegan buffets: soul food, brunch, indian food! while flore cafe is still around (they not be for long), you should really take advantage of their ten buck all you can eat deals…starting with this weekend. saturday you have the amazing soul food deal as raved about above, sunday you have the incredible brunch that we have blogged about several times before, and monday you have an all new indian dinner that sounds pretty damn exciting to me. Went to brunch last week. Seriously, some of the best food I’ve eaten at Flore Cafe. I’ll be there again on Sunday! i want that mac and cheese SO BAD. i have to try to make it over there. saag paneer? are they continuing their almost-vegan ways or will it be tofu instead of cheese? they said the buffets would all be vegan, so i think/hope it’s fake paneer. yeah. still, it’s an odd choice to veganize a cheese curry dish when there are so many already-vegan delicious Indian dishes. Do you work at Flore? Because it’s really really mediocre and you keep recommending it. Seriously. I like most of the restaurants you recommend but Flore is definitely near the bottom of the list. Nope, I don’t work at Flore (or Flore Cafe, which is actually the restaurant this post is about). This is the only vegan buffet in LA right now, though. I enjoy it, and I don’t want to see it go away. Just got an email from Flore Cafe, the “saag paneer” is vegan! I ate the soul food buffet last weekend, and the brunch as well. Both were fantastic!! Don’t listen to the haters, this is a great deal. I’m not sure what some people are expecting for a $10 all you can eat deal, but I had the soul food buffet last week and it was great, especially for the price. The food was free flowing, everything tasted delicious, I watched refills being made fresh in the kitchen and brought out for serving, the staff was exceptionally friendly and even offered to let me take extra servings of whatever I wanted home with me. Nothing was dry, old, dirty or boring- I enjoyed everything they served. I agree with Kelly… if anyone is reading this far, don’t listen to the haters and go try it out for yourself. If you still think you got screwed for your $10 then I don’t know what to tell you other your standards are much higher than mine. Sorry Miranda, I just confused my Flores. The Flore CAFE was shut down. As in the one with the buffet. That looks so good right now. quarrygirl you’re recommendation of flore cafe is spot on in my book. Thanks for putting the word out! I’ve been loving these buffets! I hit all 3 this weekend! They were great, Sunday was so packed that I didn’t even get to try everything. My wife and I recently visited Flore Cafe. We’ve been to Flore as well, and love their tuno-melt. No doubt, the food is delicious. My question is, why are both locations so dumpy?? We paid $28 bucks for two sandwiches with two iced teas. Not a cheap lunch, but it’s so good I don’t care. What I do care about is the “B” rating in the window, and the unappealing atmosphere. I’ve noticed a trend in many LA vegan restaurants, the atmosphere leaves something to be desired. Why is this? Are compassionate business owners not smart business people? I would never bring a carnivore I want to convert to vegan to this place.